St Mildred Poultry was originally built at least as long ago as the twelfth century, around 1175, and is possibly even of Saxon origin, bearing in mind that Mildred or Mildthryth, the daughter of one saint, the sister of two, and one herself, was born in Mercia, in 694. It was burnt down in the Great Fire of 1666, and rebuilt by Wren in 1671-4, only to be demolished in 1872, when the parish was merged with St Olave Jewry. The weather-vane in the shape of a ship salvaged from St Mildred still survives, on top of St Olave Jewry. Some salvaged furniture also survives, in the church of St Paul in Goswell Road. 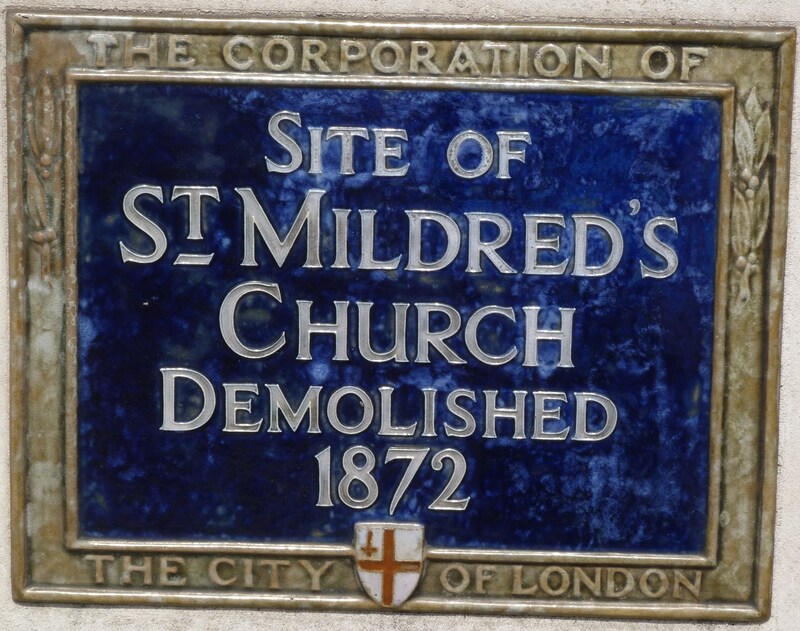 A Corporation “Blue Plaque” marks the former site of St Mildred. This entry was posted in Lost Wren churches, Sir Christopher Wren, Site is on a Lost City of London Tour and tagged St Olave Jewry on February 15, 2015 by Bob Jones - The Lost City of London.